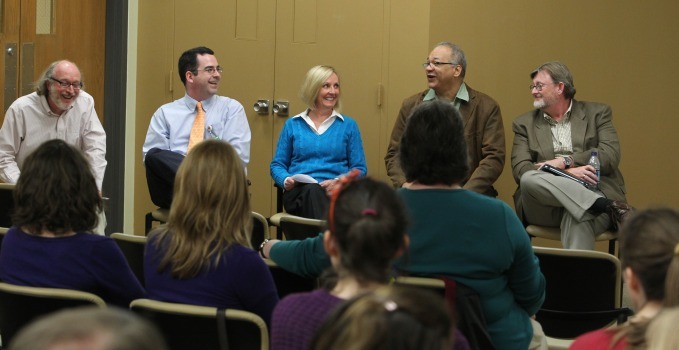 Vanderbilt researchers from the Department of Pediatrics, Peabody College and the Divinity School joined with parent advocates for a panel discussion on the ethical considerations of “curing” disabilities. The April 5 event was part of the Vanderbilt Kennedy Center to inform the university community about ethics related to conducting research, especially issues involving individuals with disabilities. The discussion specifically focused on autism and Down syndrome as examples, and a parent of a child with each disability participated in the conversation. “There is tension within the disability community between curing the disability and living with the disability,” said Robert Hodapp, professor of special education and director of research for the VKC University Center for Excellence in Developmental Disabilities. He explained that with Down syndrome, the general emphasis is to celebrate the strengths of the syndrome, whereas with autism, the focus is often on finding a cure. 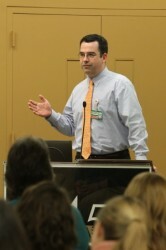 Parent advocate Sheila Moore, mother to a 21-year-old with Down syndrome and executive director of the Down Syndrome Association of Middle Tennessee, explained that the path of a family who has a child with Down syndrome is much different than that of a family facing autism because the diagnosis is at birth. Kyle Brothers, instructor in the department of Pediatrics, says while it is right to work towards cures for disabilities, he would like to see more effort put towards lightening the burdens faced by families who have a member with a disability. Victor Anderson, Oberlin Alumni Professor of Christian Ethics, discussed the historical but often still prevalent confusion of disabilities and cures within religious communities. Shouse stressed that with any child, it is important to “over believe” in their abilities and have the highest expectations for them.